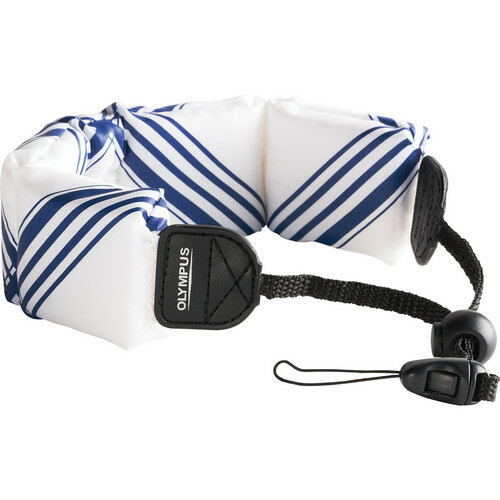 The Floating Wrist Strap from Olympus is white & blue and made to keep your waterproof point and shoot camera afloat and easy to find in the water. The colored strap is easy to see in pools, lakes or oceans. It provides surfers, kayakers and other active swimmers with the ability to strap the camera to their arm, freeing their hands when not taking photos. To attach the strap to the side of your camera, detach the end loop clip, thread it through the camera lug and re-attach the clip to the strap. Compatible with any point and shoot underwater camera with a side lug. Box Dimensions (LxWxH) 4.6 x 4.4 x 1.9"